Integrated Projects provides a multi-purpose, low cost solution to monitor, track and control vehicles, their operation and cargo for Logistics, transport and FMCG industry. 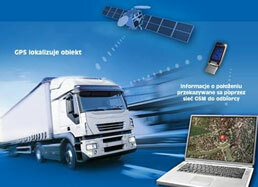 Besides of vehicle, driver’s activity and working hours can be monitored as well. For stationary applications, like infrastructure monitoring, same devices can be used. The advantage is that no data cabling is needed, the data will be transmitted using GSM network. A subscription to GSM operator’s network (SIM card) is required.